Welcome to this new era of technology where you can remotely or rather wirelessly control your devices on the go and what more do you expect when a very simple app can do this wonder for you! The name of this application is ‘Knock’. It has already been released and welcomed with great reviews worldwide. This ‘Knock’ app uses a perfect combination of an iPhone app (offered at an introductory price of $3.99) and a Mac app which is available for free at Knock’s website. It will use these two apps together to unlock your Mac just by knocking the back of your iPhone a couple of times gently. Yes, you read it correctly! Just a couple of knocks would do the trick. It is a beautiful experience I would say. 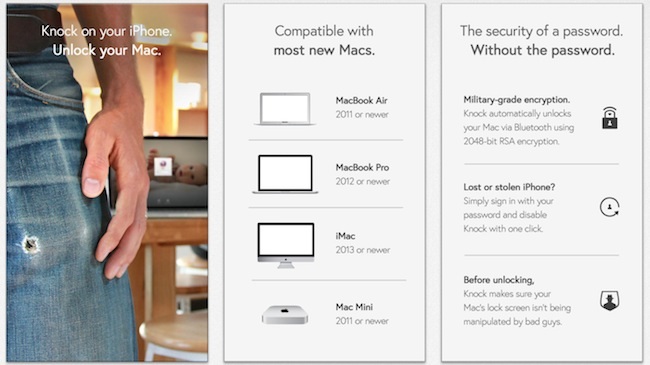 The setup will take a couple of minutes and to test then you can lock your Mac and knock the back of your iPhone twice. Within a moment, there will be echoes of the virtual ‘sound wave’ appearing on the OS X’s lock screen indicating that the system pair is actually working. There is no need to open the app on the phone to unlock your Mac but it is necessary to run the app in the multitasking tray. The specialty of Knock is – it can work even when your iPhone is locked. Whenever the synced Mac is in a detectable range, a notification will appear on the lock screen asking you to knock. Knock uses Low Energy Bluetooth to communicate with your Mac. This helps the app to work even though its backgrounded using the CoreBluetooth API’s first introduced in iOS 5. This low-energy feature also reduces the battery drain of your iPhone. If you want to take full advantage out of this app, you will need a recent Mac and a newly edition of iPhone (4S or later) that has the latest Bluetooth 4 compatibility. If you don’t know much about your Mac or iPhone, there is a Mac menubar which will tell you during the setup whether your Mac supports these or not. Practically the pair of devices failed on a couple of occasions. It couldn’t even detect the Mac even when it is within the range. Restarting the app helped me but i guess that is not a permanent solution to this problem. No doubt this is one of the best technical releases that I’ve seen this year and its working is also pretty cool. I don’t think typing a login password for Mac is a tedious task for any one of us. It is not even time taking. Seldom happens that we lock our Mac many times a day. So an easy and hassle-free unlocking is not that much needed. The most intriguing problem is that if your Mac and iPhone gets stolen altogether, then all the security is foregone as the thief can unlock your Mac even just my knocking your iPhone twice even in the locked mode. There are small glitches in all apps we come across but that doesn’t mean that we will never use the app. Knock is a very good app for people whose time is ticking faster. As its use will differ from person to person, I would recommend you to take a risk of $3.99 and buy Knock. If you don’t like it, you can at least discard it but if you don’t use it, you will never get to know how good the app is.